Also known as Heliotrope, Bloodstone is a green jasper with red spots. It is claimed that bloodstone is helpful in overcoming depression and melancholy especially when worn next to the skin. Helpful to those with psychosomatic illnesses and emotional pain. It inhibits bleeding in wounds. 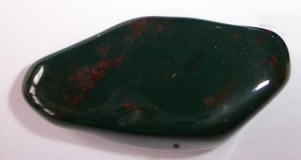 Bloodstone is believed to enhance bravery and ward off harmful vibrations. It enhances the immune system, helps with problems of the heart, blood vessels, bladder, influenza, colds, infections and inflammation.